Personal Schedule page is a variant of the Events page that allows to see a schedule of a person. A useful feature is the ability to export the personal schedule as an iCalendar URL that can be inserted in your favourite calendar application and that always returns an up-to-date calendar. 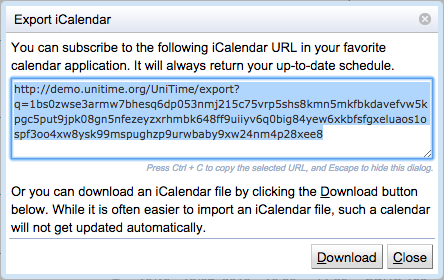 To get the URL, select the Export iCalendar option under the Export button. The following dialog appears and the url can be copied into the clipboard. Note: The personal schedule is available for students and instructors only if the academic session is in a status that includes no-role class schedule, midterm exam schedule, and / or final exam schedule (the status type's properties can be changed in the Edit Status Type screen).